Light weight and efficient use of material, The Tetrafoil Truss are the ultimate cellular kite system, the Tetrafoil Truss is the kite-art collector's single-line show kite, beautiful in flight and as suspended sculpture within interior spaces. The Tetrafoil is based on the classic tetrahedral form, inspired by Alexander Graham Bell, incorporating Guildworks patented tension-suspended airfoil system and efficient structural system. 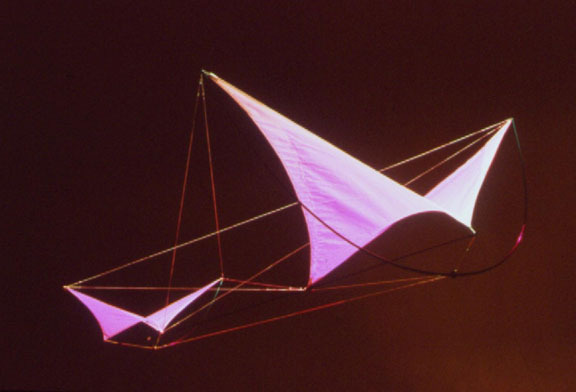 The Tetrafoil Truss is a very easy to set up as a cellular kite and it is easily expandable by adding cells. The Tetrafoil Glider, is a graceful flying machine outdoors and a controllable single line line indoors. Based on the same principles of GulidWorks patented tension-suspended airfoil system, the Tetrafoil Glider is an elegant lightweight kite ideal for a wide range of skill level.